A Pharmacy has operated right here since 1970, with a continuous succession of pharmacists/owner management. Maintaining our professionalism is no accident. No matter where you live in Lancaster County, we deliver your order personally at no extra charge. Outside of our delivery area? We offer a free mailing service. Feel free to ask questions about your prescription. At Ganse, you can talk to a friendly pharmacist who knows the answers. And our advanced computer system keeps all your records confidential (HIPAA Compliant) and readily accessible for tax or insurance purposes. Take advantage of our monthly charge account service. Or use MasterCard, Visa or American Express. If you are between 60 and 65, take a 10% discount. If you are over 65, take 15%! We cheerfully handle all Welfare HMOs and other third party prescription plans. Call in your prescription renewals anytime, day or night, with our 24-hour answering service. Or refill your prescriptions online. We are right on the corner of West King and Charlotte. We are open 9:00-5:30 Monday through Friday, closed Saturdays. And remember, you can call anytime. 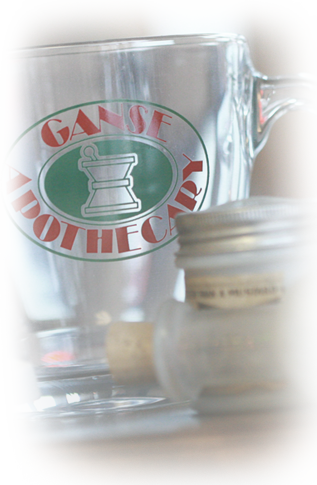 Ganse Apothecary utilizes proven technology in an effort to further our tradition of Quality, improve customer service and enhance patient care. Through a combination of precise automated dispensing, bar code enabled workflow management software, and highly flexible workstations, Ganse Apothecary delivers first-rate patient safety, real-time Rx tracking, and in-depth performance analysis.